Figure 1. Light and dark patches representing the variation of the temperature of the CMB radiation after all foreground sources have been subtracted (after COBE)26. The different regions represent temperature differences of the order of 0.01% above or below the average sky temperature of 2.73K. These CMB observations are consistent with the general relativistic creationist models of Humphreys8 and Gentry,9 which explain the current state of the universe within a creationist timeframe. However, they are inconsistent with all big bang cosmologies. In both creationist models the matter distribution is bounded, while space may or may not be. The red-shift, too, may show we are in a preferred frame of reference. The Cosmological Principle, which assumes that the universe is unbounded, is an evolutionary assumption—an untestable hypothesis. Gentry’s model explains red-shifts, CMB and the paucity of quasars past red-shift, z = 4, in a static space-time.9 It is a finite universe model consistent with all observational data. The elongated shapes or ‘blotches’ in the two-dimensional temperature maps (shown in Figure 1) in the CMB have been interpreted by Gurzadyan as the effect of geodesic (trajectory) mixing on the properties of a bundle of CMB photons propagating through space.12–14 That is, because a bundle of photons is not a point object, the individual photons follow different paths from the source to the receiver. The result at the receiving end is an enlarged and smeared image as illustrated in Figure 2. This results in a distinct signature and depends on the geometry of space, indicating that a negatively curved Friedmann–Robertson–Walker (FRW) universe will produce the observed elongated anisotropy spots (Figure 2). Thus, the blotches are not the result of some ‘clumpiness’ of the radiation density soon after the big bang. The negatively curved FRW universe refers to the standard big bang cosmology where the curvature constant k = –1, which usually means the space is open and infinite. This may be contrasted with a closed universe with a positive curvature constant k = +1 or a flat universe where k = 0. The latter is usually referred to as Euclidean space and is what we are familiar with on a local scale. However, on a galactic or universal scale, reality may be different. The dynamic behaviour of galaxies and galactic clusters begs for dark matter, as will be explained later, but to date none has been found. According to McGaugh,10 recent Boomerang data,4 which contain the amplitudes in the angular power spectrum of the anisotropies in the CMB radiation, suggest that the universe is filled with normal (baryonic) matter, and not with exotic particles or cold dark matter (CDM). where v is the velocity of the outer-most stars determined from Doppler measurements of their proper motions, r is their distance from the centre, and G is the universal gravitational constant. This mass calculation is then compared with the mass of the observed number of stars in the galaxy and found to be an order of magnitude larger. Hence the need for additional non-luminous matter to balance the calculation—dark matter. where V is the rms averaged velocity of the member galaxies, and R the estimated radius of the entire cluster. Essentially the same calculation can be performed on a cosmological scale when assumptions about the cosmology of the universe are made. These calculations determine whether the universe has sufficient mass density for closure to occur and the current expansion (as the red-shift of galaxies is interpreted to mean) to be halted or reversed. The standard cosmological paradigm is of a universe in which ordinary matter comprises only about 10%, and the other 90% is in non-baryonic forms. The latter may include the elusive axion, WIMPs (weakly interacting massive particles) or other unknown particles, which allegedly don’t interact with light. However, the large fingerprints are just not observed. These two issues are fundamentally important to the evolutionary cosmologist. The missing dark matter in galaxies, galaxy clusters, and the whole universe, and the smoothness of the CMB radiation create unassailable problems in the formation of stars and galaxies in the ‘early universe’. Prof. Stephen Hawking in his book said, ‘This [big bang] picture of the universe … is in agreement with all the observational evidence that we have today’, but admitted, ‘Nevertheless, it leaves a number of important questions unanswered ….’19 The important questions left unanswered, of course, concern how stars and galaxies could have originated. Creationist cosmologies may also require some dark matter (which may be ordinary but unobserved baryonic matter), but only to account for the orbital motion of stars in spiral galaxies. Even without this form of dark matter the observed orbital motions are not necessarily a problem for the creationist. Possibly the galaxies were not in equilibrium when they were created, and have not had time to disintegrate since. This of course assumes that only 6,000 years or so have passed on the galaxy in question. Some creationists have suggested that this may not have been the case.8 On the other hand, evolutionary (big bang nucleosynthesis) assumptions require large quantities of non-baryonic dark matter. The Creation model has no such constraint. Some 30 years ago a ‘density wave’ theory was postulated to solve the ‘wrap-up’ problem in the arms of spiral galaxies.20 That is, the arms of spiral galaxies should be very tightly wound if they are indeed billions of years old. Apparently, it requires much fine tuning to get the theory to work,21 and recently has been called into question by the very detailed spiral structure in the central hub of the Whirlpool galaxy, M51, discovered by the Hubble Space Telescope. The new observations show that the inner spiral structure extends inward further than was previously thought. The spiral arms are wrapped about the centre for about three full turns,22 which the density wave model does not explain well. Kennedy eloquently sums up the problem: ‘…the precise physical recipe that predicts their [density waves’] behaviour continues to elude us’.23 Even though no such problem exists for the creationist, I suspect that an understanding of the structure in tightly-wound spiral galaxies will need to include some dark matter. But this will only be of the ordinary baryonic form, not the hypothetical, non-baryonic CDM. Models for the angular power spectrum of fluctuation in the CMB have many free parameters, making it possible to fit a wide variety of models to a given data set. However, the baryon content is the principal component that affects the amplitude of the odd and even peaks, and may therefore be used to predict what should be observed. Based on standard cosmological theory for the baryon content prescribed by big bang nucleosynthesis and the abundances of light elements, both peaks should be present. But, when CDM dominates, the even numbered peaks should be foremost. If CDM is negligible, the second peak should have a much smaller amplitude. The latter is consistent with the Boomerang data.4 Considering the LCDM model,18 all reasonable variations of parameters considerably over-predict the height of the second peak compared with the data. As McGaugh shows, the a priori prediction for a purely baryonic universe is totally consistent with the data. The amplitude of the second peak is much smaller than that predicted by LCDM models. If we believe in the experimental method and the principle of falsification, there is one glaring result of this analysis; either non-baryonic cold dark matter doesn’t exist, or big bang cosmology, on which the prediction is based, is wrong! This, of course, presumes that the anisotropy in the amplitudes of the CMB radiation is correctly interpreted. Assuming the latter for the moment, if CDM doesn’t exist, the big bang cosmologists have problems explaining the existence of galactic clusters. Another consequence is that the observed mass density, without CDM, is too low for closure, and, as a result, would indicate the universe is open or has negatively curved space. The latest evidence from the Boomerang data strongly suggests, based on standard big bang cosmology, either that there is no CDM, or that big bang cosmology is wrong, or both! It cannot be ruled out that contradictions in the models exist simply because the big bang cosmology is wrong. In this case, it may be impossible to get any predictions to fit the observed data in the fine detail, because incorrect assumptions were made in the first place. In any case, the Boomerang data indicate that the big bang cannot explain the formation of galaxies and clusters. Conversely, these latest findings about the anisotropy of the CMB are consistent with creationist cosmologies, which do not require these ‘ripples’ to explain galaxy formation in the early universe. Smoot, G.F., Gorenstein, M.V. and Muller, R.A., Detection of anisotropy in the cosmic blackbody radiation, Phys. Rev. Lett. 39:898–901, 1977. Cayon, L. and Smoot, G.F., Hot and cold spots in the first plus second year COBE/DMR maps, Astrophys. J. 452:487–494, 1995.
de Bernardis, P. et al., A flat universe from high-resolution maps of the cosmic microwave background radiation, Nature 404:955–959, 2000. Anderson, J., Cosmic background: no conflict with reality, Physics Today July, pp.14–15, 1993. Levi, B.G., COBE measures anisotropy in cosmic microwave background radiation, Physics Today June, pp. 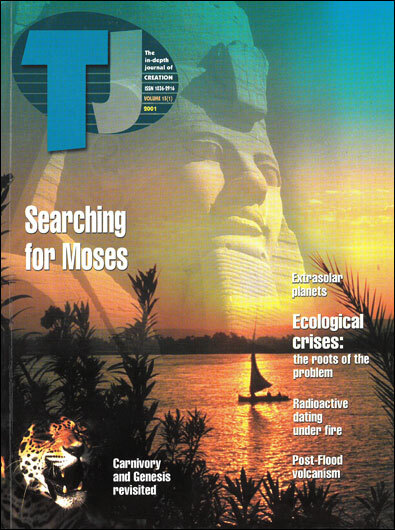 17–20, 1992. Dotson, A.C., Cosmic background: no conflict with reality, Physics Today July, p.15, 1993. Humphreys, D.R., Starlight and time, Master Books, Colorado Springs, 1994. Gentry, R.V., A new redshift interpretation, Modern Physics Letters A 12:2919–2925, 1997. McGaugh, S.S., Boomerang data suggest a purely baryonic universe, Astrophys. J. 541:L33–L36, 2000. Rowan-Robinson, M., Dark doubts for cosmology, New Scientist 129:24–28, 1991. Gurzadyan, V.G., Kolmogorov complexity as a descriptor of cosmic microwave background maps, Europhys. Lett. 46:114–117, 1999. Gurzadyan, V.G. and Torres, S., Testing the effect of geodesic mixing with COBE data to reveal the curvature of the universe, Astron. Astrophys. 321:19–23, 1997. Gurzadyan, V.G. and Kocharyn, A.A., Anisotropy of cosmic microwave background radiation: a test for inflation and W, Europhys. Lett. 22:231–234, 1993. DeYoung, D.B., Dark Matter, Creation Res. Soc. Quart. 36(4):177–182, 2000. Bruck, M.T., Exercises in Practical Astronomy Using Photographs, Adam Hilger, New York, 1990. Blumenthal, G.R., Faber, S.M., Primack, J.R. and Rees, M.J., Formation of galaxies and large-scale structure with cold dark matter, Nature 311:517–525, 1984. Ostriker, J.P. and Steinhardt, P.J., The observational case for a low-density universe with a non-zero cosmological constant, Nature 377:600–602, 1995. Hawking, S., A Brief History of Time: From the Big Bang to Black Holes, Bantam Press, London, 1988. Scheffler, H. and Elsasser, H., Physics of the Galaxy and Interstellar Matter, Springer-Verlag, Berlin, 1987. Humphreys, D.R., Evidence for a Young World, Answers in Genesis, Acacia Ridge, Queensland, 2000. Zaritsky, D., Rix, H.-W. and Rieke, M., Inner spiral structure of the galaxy M51, Nature 364:313–315, 1993. Kenney, J., More whirls in the whirlpool, Nature 364:283–284, 1993. Pease, R., Globs in space, New Scientist 167(2253):5, 2000. Aller, L. H. and McLaughlin, D. B., Stellar Structure, Univ. of Chicago Press, Chicago, 1965. COBE, DMR images, <http://nssdca.gsfc.nasa.gov /anon_dir/cobe/images/dmr/cmb_fluctuations_big.gif>, 31 July 1998.